I build dioramas that are inspired by pictures I have seen on books, magazines and the internet. 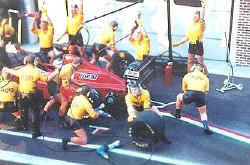 The Ferrari pit stop took three attempts to get it right. Most of the sixteen mechanics are figures I modified from the basic Tamiya kits we all know. 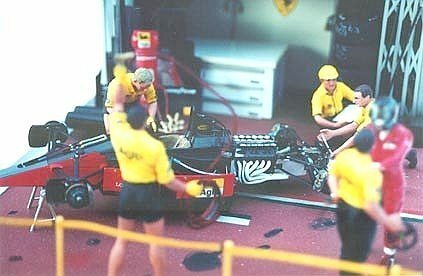 Three of these were used, plus one of the older "Racing Pit Team" (Item #20011) was used for things such as the standing photographer. 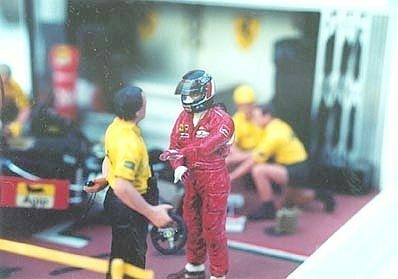 The garage in the background was built from scratch using sheet styrene and balsa wood. The Monaco Pit Lane was built along the same lines as the Pit Stop diorama, using the same Tamiya kits. 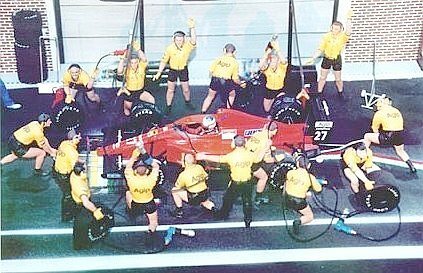 It was built to be entered in the MASSCAR MODEL CLUB exhibition of 2001, where one of the themes was "Best Formula 1 Monaco Car".